This extraordinary documentary provides an illuminating and richly discussible case study of immigrant acculturation in contemporary America. With keen sensitivity to detail and a sharp eye and ear for nuance, the film explores the lives of three teenagers as they come of age in Lowell, Massachusetts. Children of Cambodian refugees, the three teens inhabit a gritty blue-collar American world that is indelibly colored by their parents’ nightmares of the Khmer Rouge. Traditional Cambodian dance links each of them to their parents’ culture, but fast cars, hip consumerism, and young romance pull them even harder into American popular culture. Their parents fled the Khmer Rouge genocide in Cambodia in the 1970s, trekking through the jungle to refugee camps in Thailand. In the early 1980s, they resettled in Lowell, a historic New England mill city now home to America’s second-largest Cambodian community. For these immigrants, Lowell offered hope of safety and employment and a chance to rebuild some of what was shattered by the Khmer Rouge. But for their children, the city offers a dizzying array of choices — many of them risky. Deftly interweaving scenes of great poignancy and scenes of engaging drama, “Monkey Dance” examines how the three teenagers navigate the confusing landscape of urban American adolescence and ultimately start to make good on their parents’ dreams. Linda Sou is a freewheeling 17-year-old who struggles to overcome the shame cast on her family when her older sister was imprisoned for murdering an abusive boyfriend. Linda has been dancing since age three, when her father founded the Angkor Dance Troupe in an attempt to preserve traditional Cambodian culture. Over time, Linda is lured away from the dance troupe by the excitement of fast cars and hot dates. Her wild ways intensify until she and a friend are injured in a serious car accident. A trip to Cambodia with her family to meet her village relatives endows Linda with some perspective on her life and a new awareness of her parents’ losses and sacrifices. Samnang Hor, an athletic 16-year-old born in a refugee camp in Thailand, is driven to achieve to make up for his two older brothers, who dropped out of high school because of their involvement with gangs and drugs. Sam works hard, and his mentors encourage him to see education as a way out of the ghetto. On the exciting day he receives his college acceptance letters, he also realizes that getting into school is only part of the challenge — finding money to pay for it may be even more difficult. Sochenda Uch, a lanky, fashion-conscious 16-year-old, works a series of part-time jobs to pay for the necessities and accessories of teen life — while his mother worries that he doesn’t study enough. Hungry to reinvent himself, Sochenda drops out of Angkor Dance Troupe and becomes a backup dancer in a hip Cambodian-American band. Too many distractions soon take their toll: Sochenda’s grades start to slide, leading him to be rejected from all the colleges he applies to. Only after another year-and-a-half of hard work does he begin to understand what success or failure means to himself and his family. Dance — both traditional and modern — is ultimately what makes a difference for the three teenagers. The Angkor Dance Troupe to which they belong provides rigor and structure in their lives. Sam performs the troupe’s signature piece: the Monkey Dance, a traditional tale about a folk hero figure that has been electrified and transformed by Sam’s addition of hip-hop choreography. Cambodian dance provides Linda, Sam, and Sochenda with a unique connection to their parents’ culture at a time when many children of immigrants reject their traditional culture as irrelevant to their lives in America. By making the dance their own, the three teenagers forge a link with the past while also finding their way in America. “Monkey Dance” will challenge and inspire students and generate discussion and analysis in a wide variety of courses in sociology, psychology, American studies, ethnic studies, Asian-American studies, and anthropology. It is essential viewing in any course studying contemporary immigration, acculturation, and popular culture in America. “Monkey Dance” was produced by Julie Mallozzi in association with ITVS, NAATA, and WGBH. The Director’s Version of the film contains more background material on the holocaust in Cambodia and more detail on the three teenagers’ experiences, as well as a few instances of unedited street language. It is not closed-captioned. The PBS Version has been edited for street language and is closed-captioned. “This brilliant film brings to life so many of the important issues facing today´s second generation — children born in the U.S. of immigrant parents. 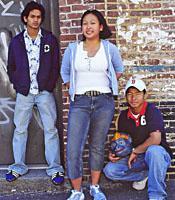 The young people in this film face the challenges of growing up both American and Cambodian. They overcome many obstacles growing up in poor neighborhoods and with few resources and they discover through dance the rich heritage of their parents´ homelands. This rich and engaging film is a terrific resource for courses on immigration, ethnicity, American studies, sociology, and anthropology. My students loved it!” — Mary C. Waters, Prof. and Chair of Sociology, Harvard Univ.